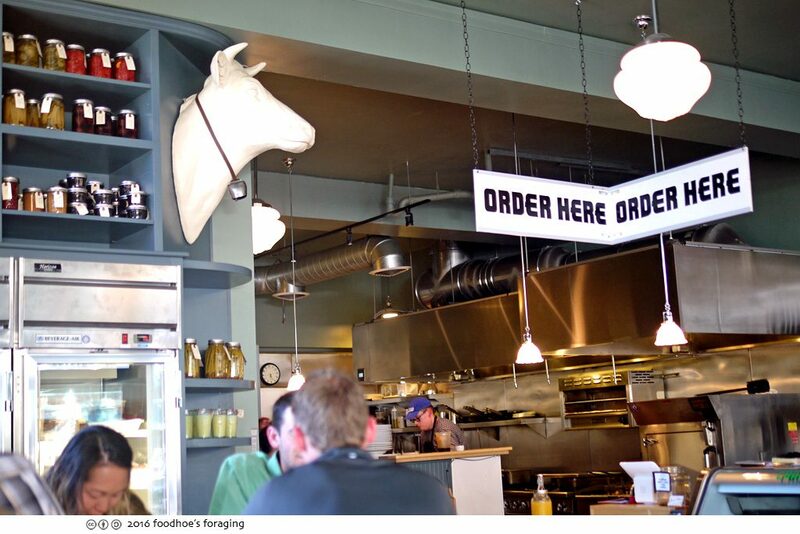 Breakfast is my favorite meal of the day and when I saw that Clove and Hoof in Oakland was offering a special southern brunch for dinner earlier this month, I immediately went online and signed up. 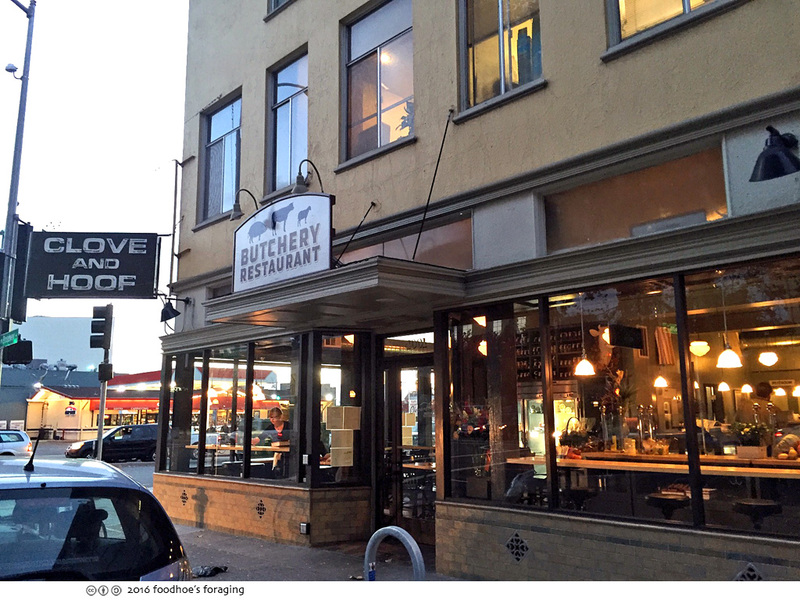 I have been hearing really good things about this place (click here for a very enthusiastic review by Nerb) and couldn’t wait to finally check it out, and what better way than with my favorite meal! 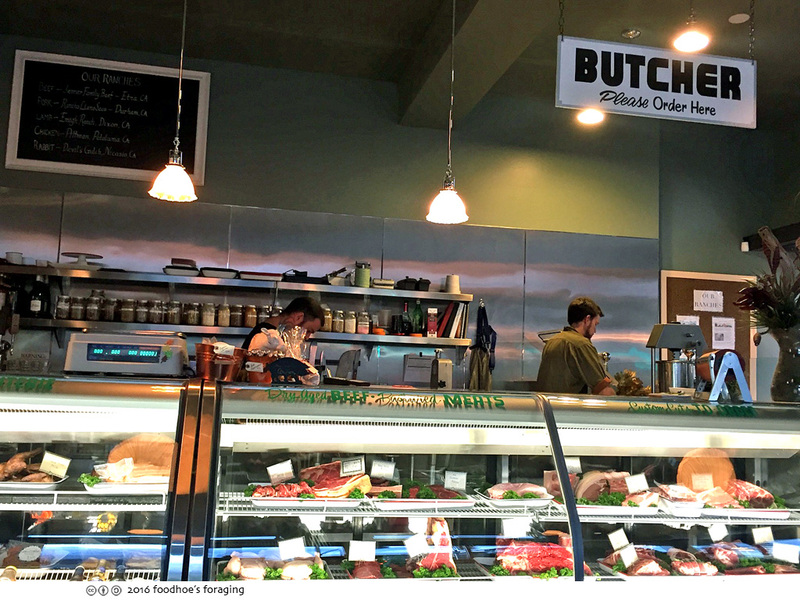 Clove and Hoof is a neighborhood restaurant and whole animal butcher shop opened by John Blevins and Analiesa Gosnell, who carefully source their product from farms that don’t use antibiotics or hormones and practice responsible and humane methods of animal husbandry. You can read more about them on their website here. 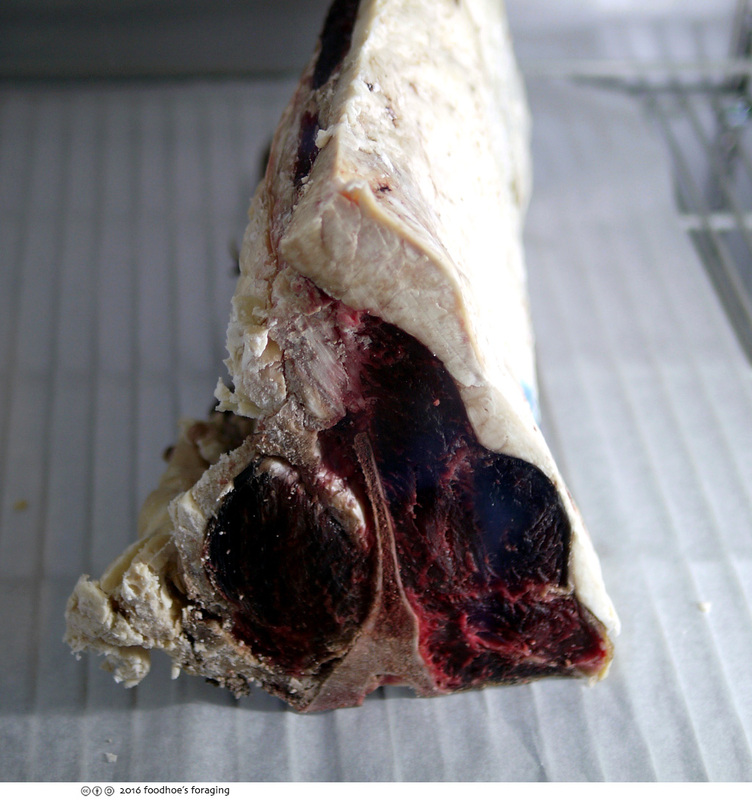 On the back side of the dining room, underneath shelves filled with jars of housemade pickles and a stylized white ceramic bust of a cow, are refrigerated display cases where you can see large pieces of meat in various stages of aging. 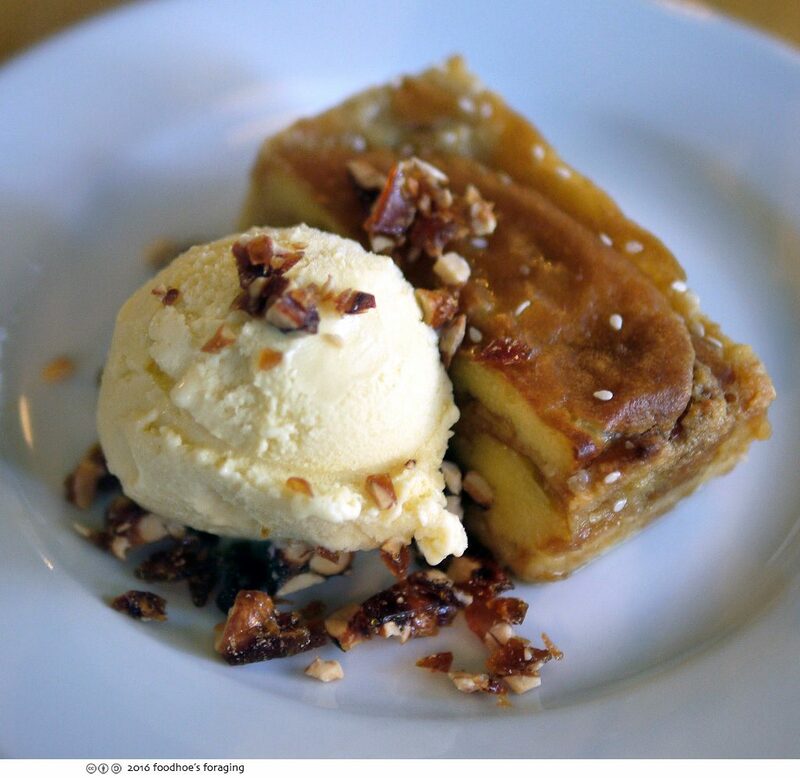 Chef John is from the south and wanted to share the flavors he grew up eating with us, and so we enjoyed the warm hospitality and platters of nostalgic comfort food! 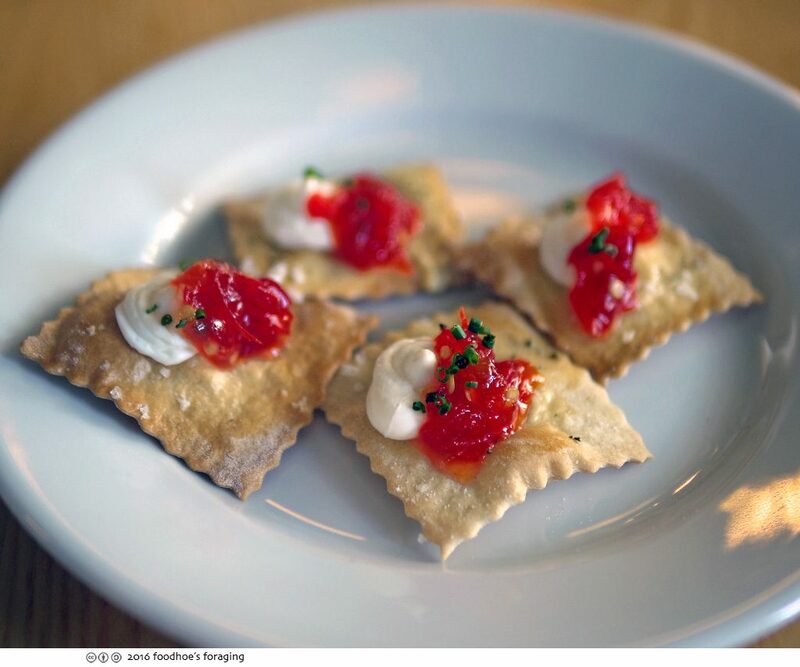 We began with a plate of house-made saltine crackers glistening with sea salt and dotted with rich cream cheese and candied chili jam and sprinkled with minced chives. 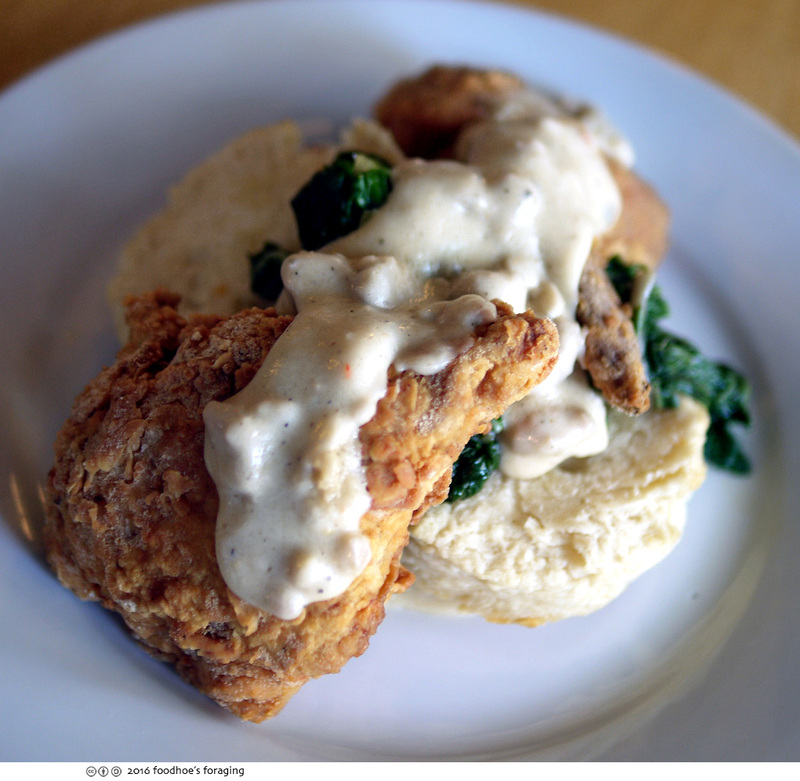 The flavors reminded me of pimento cheese and the dense crunch of the cracker was very satisfying. I ordered an icy cold PBR, even though I was told that they were pouring bottomless mimosas on the house. 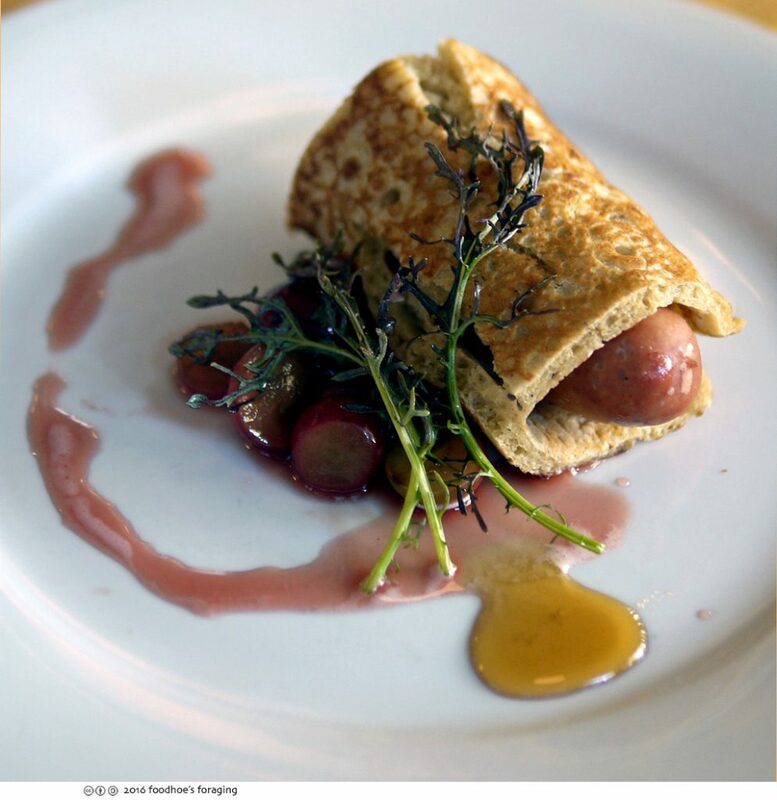 Our first course was a sophisticated version of pigs in a blanket, a full size frankfurter wrapped in a buckwheat pancake drizzled with smoked bacon maple syrup and red flame grape agro dulce. The hot dog was tender and garlicky, the flavors were outstanding and we gobbled this up with enthusiasm. 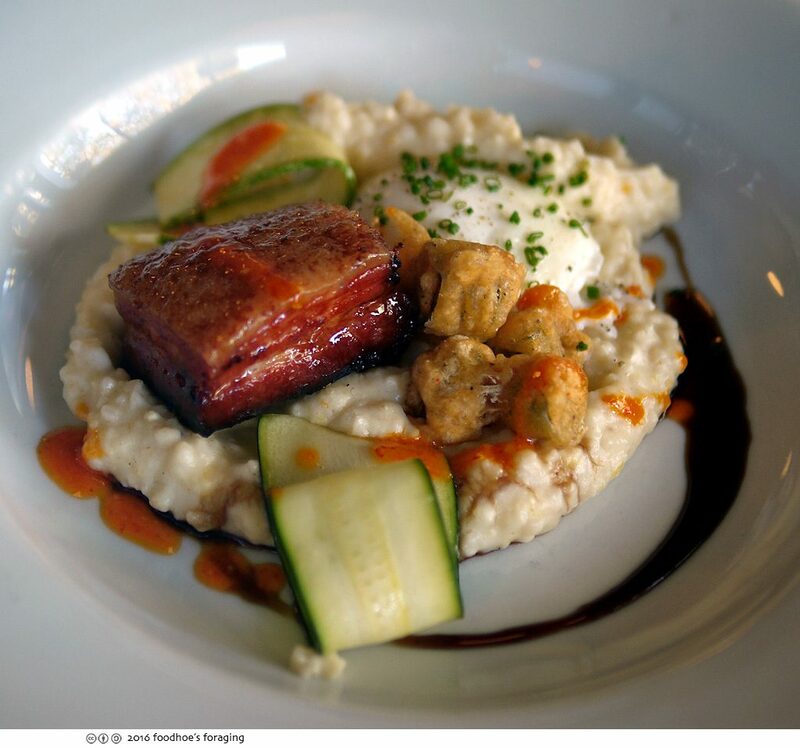 My jaw dropped when the next plate arrived, a wide bowl filled with Anson Mills grits, slices of summer squash, a handful of fried okra, root beer glazed pork belly, with a perfectly poached egg drizzled with fermented hot sauce over all. I popped the egg yolk which released a rich gravy for the buttery grits. The pork belly was sticky, moist and meaty, and was so good with the root beer reduction sauce that ringed the bowl. 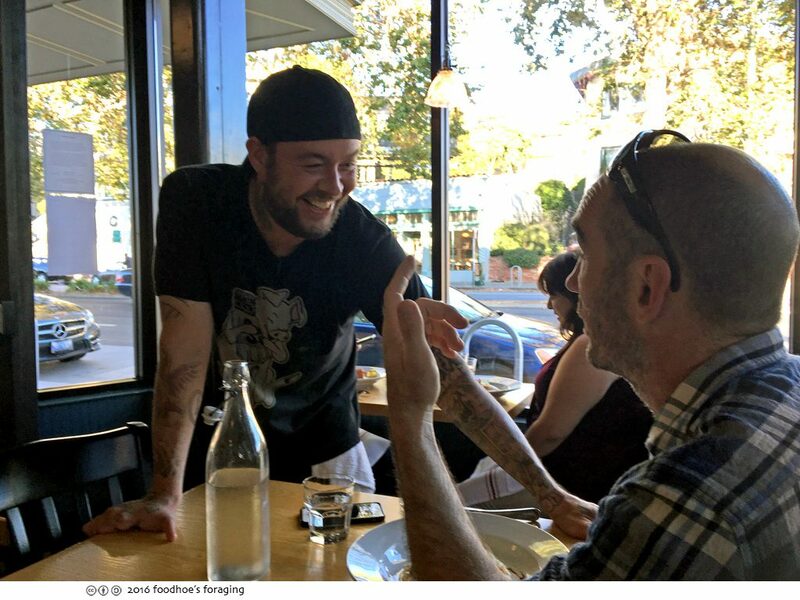 This is the chef-owner John Blevins (@john_blevins) who was serving dishes to the tables and visiting with people, checking in to make sure that everyone was happy. You can see that he is in his element, everyone was enjoying the food and the company. 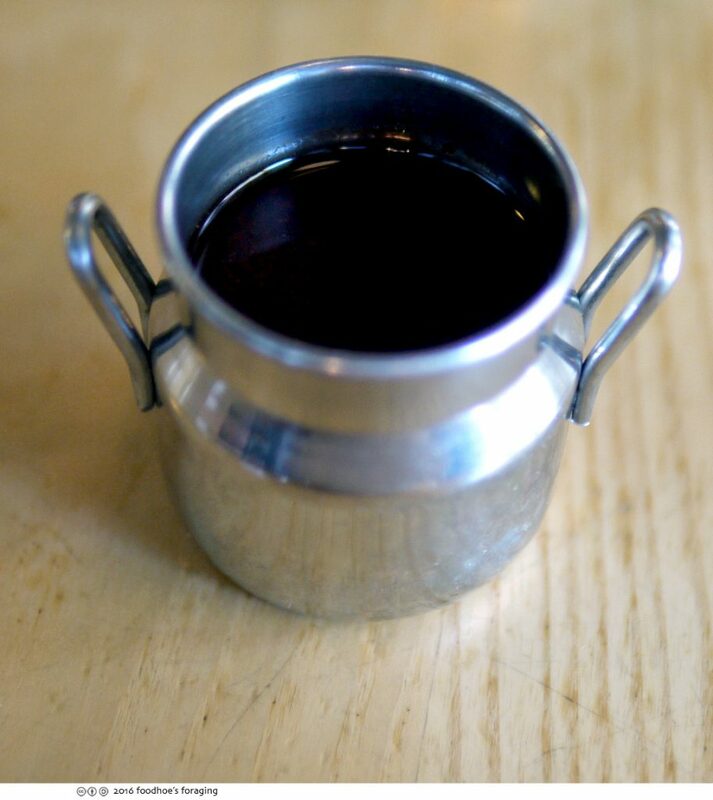 Each person was given their own tiny pail of Bomb Sauce, an intensely sweet and spicy condiment. I will admit that I wasn’t able to entirely finish the fried chicken but there were boxes on the counter for us to pack it up to go, along with little plastic tubs for the bomb sauce, because I didn’t want to go the way of the fat man in Monty Python’s movie The Meaning of Life. 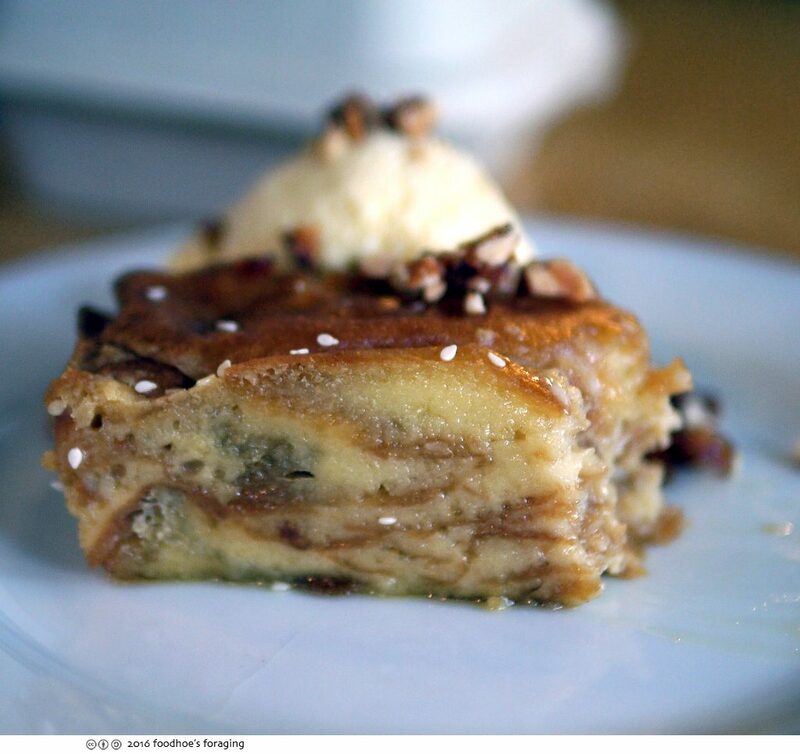 Then came dessert, a wondrous bread pudding made from Krispy Kreme donuts with shiro dashi, served with a scoop of malted buttermilk ice cream, sprinkled with pieces of white shoyu peanut brittle and toasted sesame seeds. It was incredible! 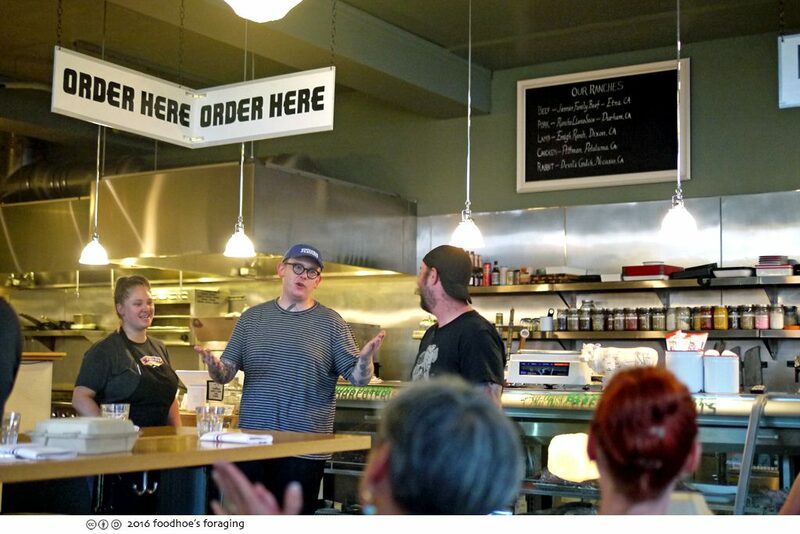 Chef John thanked everyone for coming and introduced their sous chef @killthecook who spoke briefly about what a great job he has, and who coincidentally makes a great model for their food (click here)… I am definitely going to order my Christmas porchetta from here! Open daily for lunch 11am-2:30pm • late lunch 2:30pm-5pm • dinner 5pm-9pm.